Most of us know Tuomas Holopainen as the keyboard player and main songwriter for immensely popular symphonic metal band Nightwish. But did you know from a very young age he has been a huge Disney fan. Yes, and his favorite Disney character, of the many, is Scrooge McDuck. Holopainen fell in love with Don Rosa's The Life and Times of Scrooge McDuck, a collection of stories from the Disney comic books, and he's read it dozens of times. 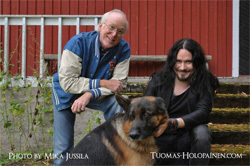 Tuomas Holopainen: with artist Don Rosa, he's the one on the left. Holopainen liked the book and stories so much that he established a goal to write music for them. The result is, the properly titled, Music Inspired by The Life and Times of Scrooge McDuck. While you know his work with Nightwish as symphonic metal, this work is pure symphonic music in the classic music style, a soundtrack, as it were, for the stories. If you have a sense for the orchestral side of Nightwish's Imaginerium, then you'll completely understand this work. It's grand, captivating, and prolific; a stunning accomplishment for this musician. It should said briefly that, while there are some vocal parts, notably within A Lifetime of Adventure (which is also the closest thing to symphonic rock here), this is mostly an instrumental work. It's also some of the most beautiful contemporary classical music I've heard in sometime. Holopainen is quite talented, and I hope this is only the beginning of his solo career in this type of music. Perhaps a film score is in the future. Easily recommended (especially a nice turn from all the heavy metal I listen to). 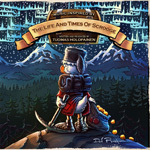 Tuomas Holopainen's The Life and Times of Scrooge McDuck is, as contemporary classical music, grand, captivating, and prolific, and a stunning accomplishment for this musician.